The Billionty-Oneth Geek: Lucky McKee's THE WOMAN!!!!!!!!!! I was lucky enough to catch Lucky McKee’s The Woman at the 2011 Toronto Afterdark Film Festival. The Woman tells the story of the Cleek family. The Cleek’s are your run-of-the-mill suburban family; you’ve got the breadwinner father, the submissive mother, the tortured soul older daughter, the rebellious son and the innocent toddler. The father, Chris Cleek, who goes hunting one day, captures seemingly, his biggest hunt to date: a wild woman. He traps her, kidnaps her and takes her to his secluded ranch house. She is locked and chained away in his dungeon like shed. He is filled with joy as he shows his family his most prized finding. He doesn’t seem to comprehend the wrongness of his actions. Yet, his family doesn’t exactly share the same sort of joy and are filled with a sense of disbelief. However, they follow along with the mad father’s idea and reluctantly go along with the hi-jinks. Chris Cleek decides the whole thing is a family project, to domesticate and teach the titular Woman how to be proper. Although seemingly well intentioned, Mr. Cleek has more insidious and perverse intentions in mind. These days, not very often do I feel moved or invested into a horror movie. But The Woman did it for me. Director McKee does a great job of painting each character and allowing the audience to dive deeper into each of them. We feel for the Woman. We sympathize with the wife. We hate the father. The whole thing works because of our investment in the characters. And McKee demonstrates patience in telling his story. There aren’t any quick thrills. It’s all a build-up to the last 10-15 minutes when all our emotions are released. One of the things that make it unique is it’s dark approach to the subject matter. It starts off innocently enough, as we’re introduced to the family. We see their quirks and we know something isn’t right, but it’s never thrown in our faces. But as the minutes roll on, the movie gets darker and darker, and suddenly the comical laughter becomes more of a nervous laughter. The violence depicted in this movie against women is quite brutal. To digress for a moment, in prowrestling lingo, this would be considered creating heat. The more deplorable the heel (i.e. the bad guy), the greater the heat. And with great heat, comes an even greater pop (i.e. cheers) when the good guy finally conquers the bad guy after a long uphill battle in the end. But there’s also such thing as cheap heat. Cheap heat refers to basically cheap shots to get the crowd to boo you. Simple examples would be making fun of the town they’re in, or pointing out people in the crowd and making fun of them. They’re cheap tactics to get boos, or to build cheap heat. This is opposed to real heat, which relies more on story driven elements to get the crowd to hate you, usually more potent and lasting. Anyways, why all this explanation? Well, in the context of the movie I’m trying to determine whether Chris Cleek’s violence towards women is a cheap heat tactic or real genuine heat. I’ve always viewed violence towards women both in movies and video games as a cheap heel heat tactic, but since in this movie it’s quite central to the plot I’m conflicted. Is it real heat or cheap? The auditorium erupted in applause and cheers when the antagonist received his just desserts, and I for one, was amongst them. So it’s hard to say, it’s certainly debatable. It’s a wacky horror movie, not one to be taken seriously. From the moment that Chris Cleeks introduces his family to the Woman with a smile on his face, we know we’re in for a ride. It’s a movie that will get your blood flowing as you cheer and boo what’s happening on screen, and to me, that’s an effective movie. 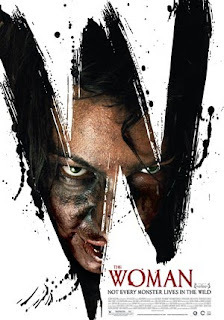 No, it might not be the best thing ever, but as far as horror in 2011, it’s probably one of the better ones. Until next time, later geeks!